March 25, 2014; 12:20 PM – The 168,000-gallon fuel oil spill that happened Saturday near Galveston, Texas caused the Coast Guard to temporarily close the Houston Ship Channel. That’s a very busy, narrow waterway connecting the Port of Houston with the Gulf of Mexico and overseas ports. In addition to the environmental consequences of this heavy oil spill, including the threat to shorebirds at the peak of their spring migration, this closure has caused a big-time backup of shipping traffic. 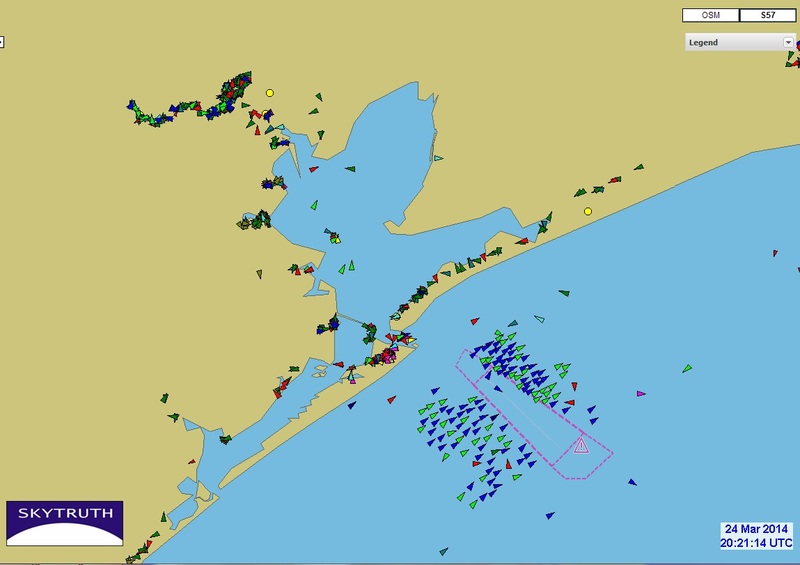 AIS map on March 24, 2014 showing ship traffic backed up as a result of an oil spill in the Houston Ship Channel. Colored triangles mark the locations of vessels of different types. Port of Houston is at upper left. Detail from above, showing large offshore holding area where dozens of cargo ships and tankers lie at anchor, awaiting clearance to enter the ship channel (marked by dashed pink line). 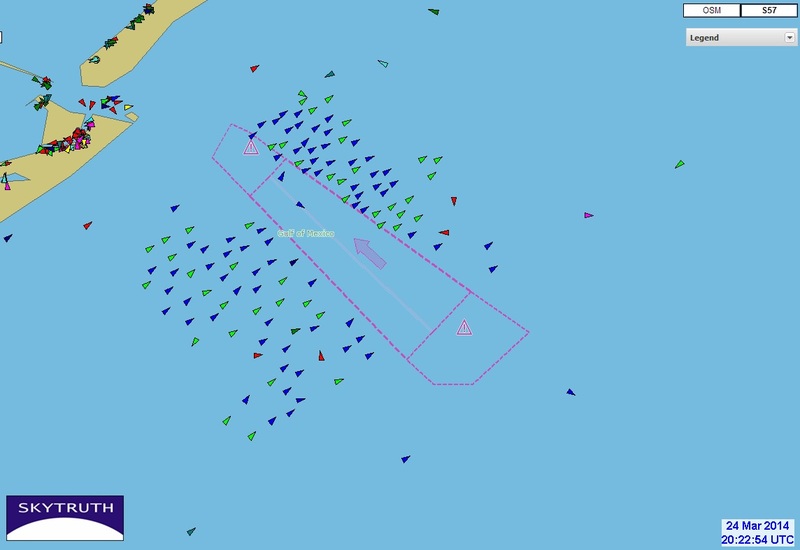 This shows a large “waiting room” in the Gulf just outside the entrance to the channel where dozens of vessels — mostly oil tankers and cargo ships — are anchored, waiting for clearance to proceed into port. There are also quite a few vessels bottled up in port, waiting to get out, including a few large cruise ships. You can see some of the AIS data yourself, and query individual vessels, at the cool Marine Traffic ship-tracking site.